Our son and daughter-in-law have lived halfway around the world from us for the last four years. We have been fortunate enough to visit them (once), and very happy to have them visit us at least once each year. They will be moving back to the U.S. very soon. At last, we will all be living on the same continent. As a result of this experience, I have begun to accept that the cell phone and “texting” do serve a purpose, even in my life. I am truly amazed at how easy it is to stay in touch with someone halfway around the world, even if it is through texting dialect! I have also caved on my initial reluctance to use an e-reader. In my case it was the result of a Kindle I received as a Christmas gift. I have a tendency to read mystery novels the way some people eat popcorn. I justified my addiction by donating the lightly read paperbacks to the local library. Unfortunately, the library will receive fewer book donations from me since the arrival of the Kindle. My “mystery” reading has focused on mystery series. I take note of how the author handles the “information dump” with the books following the initial book of the series. I’ve also focused on how different authors deal with character development. It is fun and informative. I’ve also researched children’s books. I particularly enjoyed An Elk Dropped In by Andreas Steinhofel, illustrated by Kersin Meyer and The Boy Who Was Raised By Librarians by Carla Morris, illustrated by Brad Sneed. Both are beautiful books, offbeat in their approach. Since my last post, I have been busy writing a series of chapter books. I have four manuscripts so far and have been looking for a publisher. I have heard it takes longer to find a publisher than it does to write a book. I hope that is not entirely true. I know I will eventually find a publisher who loves the characters and their stories as much as I do. Recently we have spent some time in Benicia on the California Coast. It was the first capitol of California – for one year. 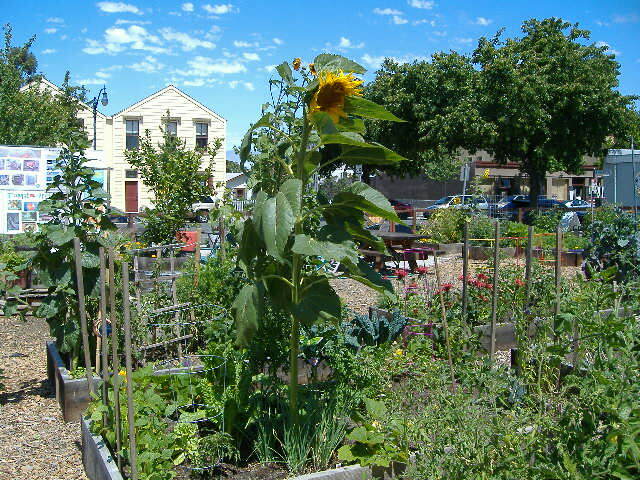 They have an amazing community garden in this small town. Here’s a picture.